Nyati organized for us, a Dutch group of eight, four Rotarians and their spouses, a busy working holiday of eleven days. A primary school near Macheke was the original goal of our visit. After the third donation to the school we decided to visit the school. Friendly Bronte Hotel was our base in Harare. 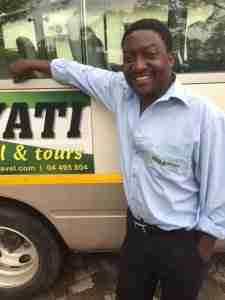 After a city tour through Harare, friendly Nyati driver Crinias (photo), drove us safely to the school. After a stay of two nights near the school we went via Murewa, where we visited the Districts Inspector of Education, back to Harare. After that our real holiday started. Flying to the Victoria Falls. The falls were gorgeous. The stay in the near Vic Falls Safari lodge is recommended. From there we went by private bus to the Botswanian border and stayed three nights in Kubu lodge. A relaxed place, from where we made two game drives and one boat cruise into the Chobe National Park. Chobe National Park near Kasane is fantastic and can compete for instance with the well known game parks in Kenya. Our trip was well organized by Nyati. l had an amazing day courtesy of a voucher extended Nyati Tours which will forever be a source of fond memories. The voucher was an awesome gift l got after winning Miss University of Zimbabwe 2015. 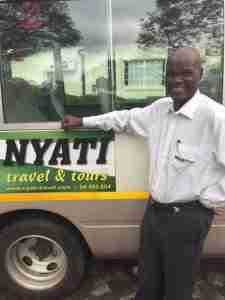 Together with my friends, Nyati Travel took us to Ngoma Kurira which is in Domboshava, 40km from Harare with a cheerful and extremely assured driver, Mr Zambezi. Upon arrival, the activities that we had included mountain climbing, site seeing with impecable views, exploration of caves that uncovered Zimbabwes history as potrayed through rock art and paintings presumed to originate from the stone age era. Not only was this refreshing but it was an enlightening experience, particularly learning the history of Zimbabwe through the art and paintings in caves accompanied by detailed commentary by our guide, who was ever present to address our curiosity. And of course not forgetting the delicious food provided! Thank you Nyathi Tours for the memories. 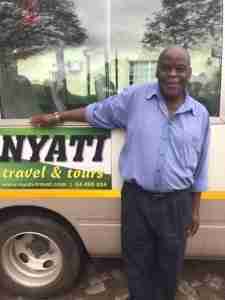 Nyati Travel & Tours organized a lovely day tour for our family during a layover in Harare. Terence from Nyati proposed that we go to Chivero, which is a lake and small nature reserve close to Harare. Even though we had just come back from Mana Pools, we agree that Chivero was a good choice, as we saw loads of rhinos and quite a few other animals. Seeing the rhinos capped off a great safari in Zimbabwe. Our guide/driver for the day, John was fantastic and took good care of us. Everything was well planned and executed: from providing tour options over email at very short notice, to confirming with us by reaching out to the remote wilderness camp where we were staying in Mana Pools (we did not have access to phone signal there, but Nyati called the camp to confirm), and ultimately picking us up and dropping us back at the airport on time. I highly recommend this company and will look forward to using their services when I am again in Zimbabwe. On Sunday 8 November there was a special Travel episode with 3Opreis on Dutch television. Great coverage of Zimbabwe, great coverage of Nyati Travel Look at the green bus so prominently featuring in de film. on 15 November episode 2. Don’t miss. (sorry guys it’s in Dutch, but the pictures age great). Want to see the journey/ Click on this link. My husband and I have just done this tour and we had a wonderful time. There were four in total in our group plus the driver, Mr Gombe. The itinerary was very good – we really enjoyed visiting the school at Old Mutare Mission, the gardens at Seldom Seen in the Bvumba (with the infectiously enthusiastic Bulawesi to guide us! ), and the tour of Serengeti 5 organic farm and ecotourist facility. We also had a very interesting visit to a tobacco farm. Our tour then travelled across the country to take in Great Zimbabwe, Matobo and Hwange before ending at Vic Falls. We all felt that our driver, Mr Gombe, did a fantastic job if getting us from one stop to the next on time but very safely, and he was the perfect driver – kind, thoughtful, funny and very patient with the various foibles of four foreigners! He was a star! We recommend this tour to anyone who wants to experience the vitality and optimism of the Zimbabwean people, and the beautiful country as well. On our 13 Day Tour of Zimbabwe.